Exceptional work in design and manufacturing. These straight blade scissors cut precisely through sections of dry hair, yet are still super smooth through wet hair. No drag or damage. The straight blade uses sliding technology to move the hair across the 23 razor sharp teeth, so the hair is cut in motion and no two hairs are cut to the same length with zero drag. Exclusive Eufora Tool Kit includes a fashionable and functional roll up bag. Designed by our own Eufora National Trainers to hold everyday essentials. The kit includes a 5 piece set of Eufora Carbon Combs, 2 silicone brushes and 1 tint brush. Use a white cape for your social media photos. It is the perfect choice when you want the hair to really pop. A long-standing barber tool now with unisex appeal. Essential for every well-rounded stylist’s tool kit. Tie back with adjustable neck strap. Convenient front pockets. One Size. Black. Oversized Eufora twin cape perfect for chemical services. Convenient snap closures. Black with contrasting logo. NEW! Prolonged continuous spray bottle with 360° spraying option - spray with the bottle upside down without leakage or loss of prime. NEW! Eufora sectioning clip with “alligator jaw” design keeps the clip from falling out. The jointed arm and flexible grip prevent lines of demarcation. Essential for every blow dry! Short sleeve v-neck unisex style, made of eco-hybrid fine cotton jersey. Black. Recommend women size down one size. Comfort combined with all the bells and whistles... thumbholes, plus media and earbud pockets. French terry cotton blend. Charcoal grey. Eufora women’s long sleeve funnel neck top is the perfect in-between season sweater. Ideal for a breezy beach day. Stone grey cotton blend. Wearable styling perfect for work or casual weekend days. Charcoal grey cotton blend. 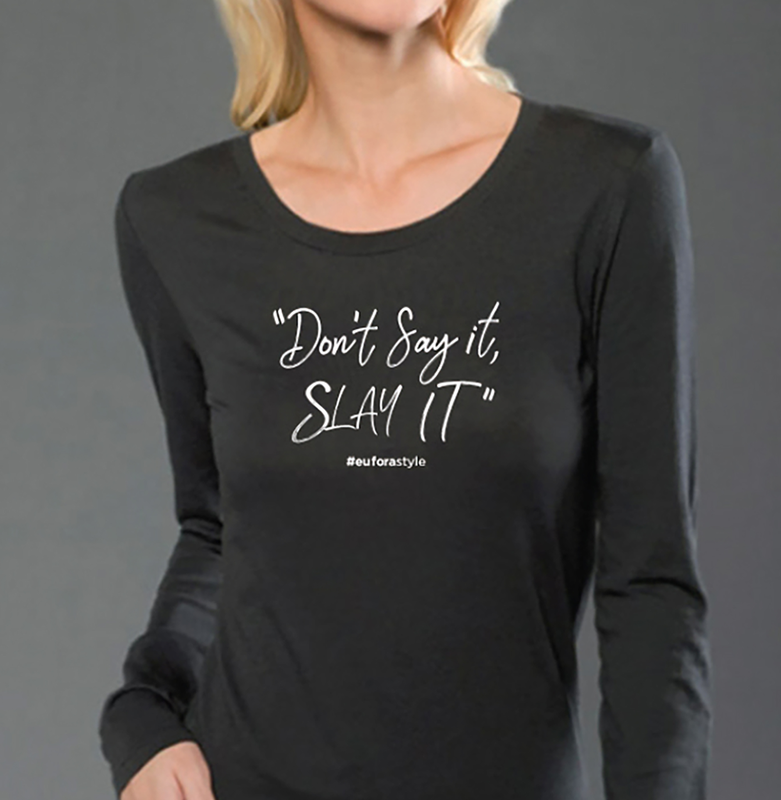 Don’t Say It, Slay It. Scoop neck women’s knit top. Luscious long sleeves and a body conscious fit for a confident style statement. Asphalt grey cotton blend. 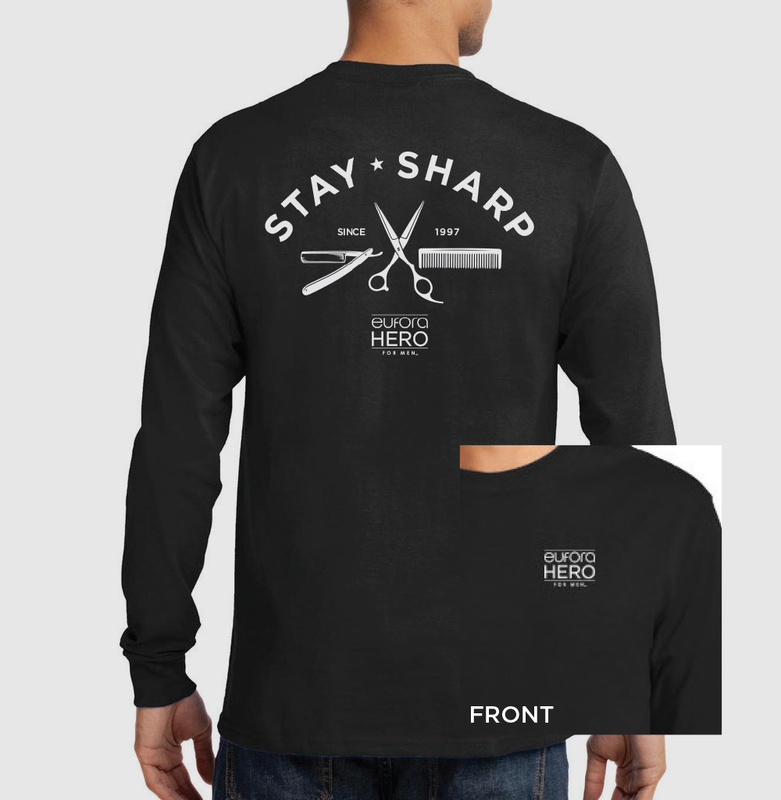 Long sleeve eco-hybrid fine cotton jersey fabric and a new signature HERO style. Black, unisex sizing. Women size down one size. Live well, be well with the Eufora yoga pant. 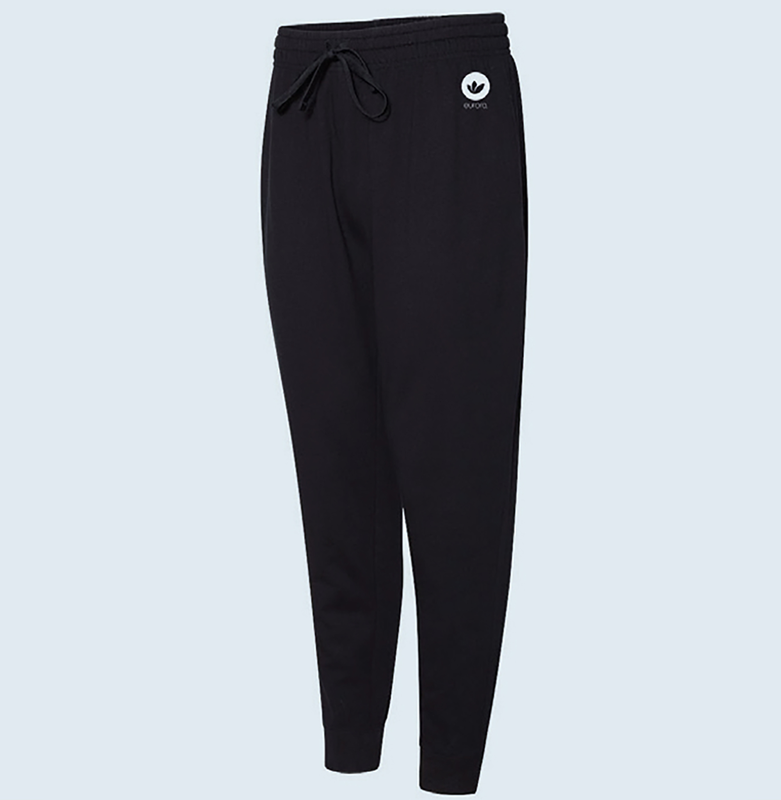 Black spandex pant features moisture wicking technology. A fusion of comfort and style with elastic, drawstring waist. Black cotton blend. Stay cozy and warm with our own Eufora micro-mink sherpa blanket. Generously sized and easy care – just machine wash and dry. Stay hydrated with our 26 oz. limited edition, double walled stainless steel water bottle. Keeps drinks cold for 24 hours and hot for 12. Includes INLOVE Essential Oil Candle, INLOVE Pure Essential Oil Blend and a 2 oz. MIXIT Natural Blending Oil. Boardroom or bedroom. Lounge or lobby. This professional quality diffuser can scent even the largest of spaces and features LED light function and automatic shut off. Mood Manifestation! Inspire instant attitude adjustment when you wear an essential oil infused diffuser necklace. Sold in packs of 10, perfect for salon gifting!